Yukiko Uno was born in 1995 in Japan. She began her violin study at the age of 4. After that she has won 1st prizes in International Violin Competition Andrea Postacchini (2016 and 2017), Chengdu Guangya Violin International Competition (2016), Czech Music Competition (2013), Gifu International Music Festival (2013 and 2014). Apart from that, she was a semi-finalist in 4th Torun International Violin Competition (2016), International Johannes Brahms Competition (2016) and International Violin Competition Henri Marteau (2017). As for performing with orchestras, she played Tchaikovsky Violin Concerto with Chamber Orchestra of Nagoya, conducted by Mr. Kazuki Wada, and with Orchestra Filarmonica Marchigiana, conducted by Mr. Michele Nitti. She currently studies with Prof. Pierre Amoyal at University Mozarteum Salzburg in Austria. Previously she has studied with the following professors: Mayumi Shindo, Natsumi Tamai, Kazuki Sawa, Ryo Mikami, Yoshitake Shindo and Herwig Zack. She also attended masterclasses given by famous professors: Pierre Amoyal, Herwig Zack, Szabadi Vilmos, Dana Vlachová, Edward Zienkowski, Ferenc Rados and Pavel Gililov. 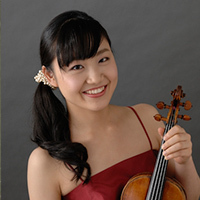 Prior to University Mozarteum Salzburg, she studied at Tokyo University of the Arts for 1 year, during which time she received scholarship sponsored by Mr. Tokuji Munetsugu with the highest score at the entrance examination.